I was looking for a video on YouTube when I stumbled upon this video titled “The Gay Debate”, I was curious as to the content of this video for I know that this issue is not debatable. The Bible’s position regarding this matter has never change. 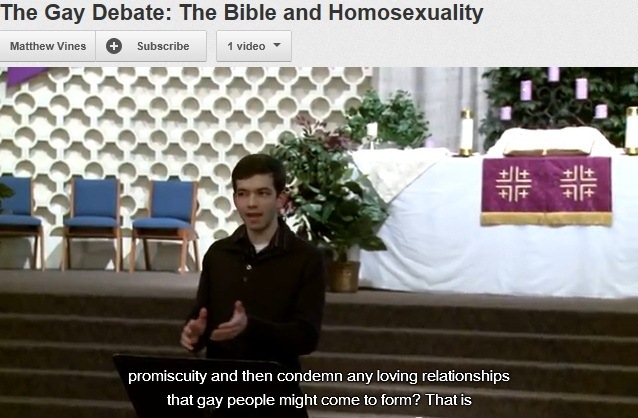 Homosexuality is condemned in the Word of God. I just want to listen to the introduction because I was curious where he was coming from. I was surprised as to how he twisted all the Bible verses that condemns homosexuality. He uses a lot of playing with the emotional heart strings. Basically, he need to change the meaning of Scripture so that he could have his version of christianity that embraces homosexuality. I was really reminded of the serpent in the Garden of Eden that said, “… did God really say … no … you will not surely die … your eyes will be opened and you will be like God, knowing good and evil.” – Genesis 3. Is Hell really eternal? How could an infinitely Holy God send people to Hell, a place of torment He created, for all eternity? Let us say that a wicked man lived on earth for eighty years, would it be just to torture a man who lived a wicked life, for eighty years, in the Lake of Fire for all eternity—an unending duration of time? If God is so loving, can’t God just let that man be consumed by the flames and vanish from existence? After all, God isn’t sadistic is He? Universalism is the idea that after some torment of people in Hell, or even without a need for suffering in Hell because of all the sins committed against God, God would eventually have mercy on them and grant them fellowship with Him. That God is too loving to allow the sufferings of people without end. Universalism is far more heretical than annihilationism—the idea that sinners would suffer in Hell, but would eventually stop from existence once they have been consumed by the flames, since sinners are not raised with glorified bodies the way Christians are. The False Teachings of Dallas Willard. It is really hard to think of a loved one spending his/her eternity in Hell. But in the end, we would realize that in reality the people we loved and have been with us while here on earth have been covered by the grace of God; and so, all the good things about them that we loved are actually the grace and goodness of God upon their lives. So great is human depravity, that apart from the grace of God, nothing but evil is left to man. Please, don’t get me wrong. I’m not saying that Christians don’t like to have a lot of people in Heaven. Far from it, it is our desire to see people converted and saved. However, we as Christians, do not say that a person can be saved apart from faith in the Lord Jesus Christ. The Lord Jesus Christ is the only way to Heaven. The real Jesus according to the Bible is God in human flesh. Chapters like John 1, Colossians 1, Hebrews 1, and Revelation 1 deal with the Divinity of Christ at length; though there are plenty of short verses that mentioned the Divinity of Christ like Romans 9:5, 2 Peter 1:1, etc. The liberal scholars are not liberals because of the evidence from history and archaeology; it is rather because of their sins that they would pervert the truth and lead others astray. No elect of God would ever be lost because of these pseudo scholars. However, we must honor God by proclaiming and defending the truth. We cannot simply ignore the blasphemies of these outright liars. And we must proclaim and defend these truths for the glory of God, and for the sake of the elect; that those who are not yet saved would be saved by the Gospel of our Lord Jesus Christ, and that those who are already believers would have a boost of confidence in their faith in the Lord Jesus Christ. I know that faith and trust are made possible by the Holy Spirit through the testimony of Scripture. Let us therefore hold fast to the written Word of God and not waver from its testimonies. They are preaching up the devil’s old favorite doctrine! There is such a place as Hell. Let no one deceive you with vain words. What people do not like — they try hard not to believe. When the Lord Jesus Christ comes to judge the world, He will punish all who are not His disciples with a fearful punishment! 2) I know furthermore, that some do not believe that Hell is eternal! They tell us it is incredible, that a compassionate God will punish people forever. They imagine that He will surely open the prison doors of Hell at last. This also is a mighty help to the devil’s cause. 3) I know also that some believe that there is a Hell — but never allow that anybody is going there! They imagine that . . . all people are good, all are sincere, all mean well, and all, they hope, will go to Heaven when they die! Alas! what a common delusion is this! If I never spoke of Hell — I would think I had kept back something that was profitable, and would look on myself as an accomplice of the devil. a god who is all mercy — but not just; a god who is all love — but not holy; a god who has a Heaven for everybody — but a Hell for none; a god who will make no distinction between godly and the ungodly in eternity. Such a god is an idol of your own imagination! It is as truly an idol — as any snake or crocodile in an Egyptian temple! The hands of your own imagination and sentimentality have made it! It is not the God of the Bible — and beside the God of the Bible, there is no God at all.